On the evening of February 1, 2019, Lu Zobel passed away peacefully of natural causes with her two daughters and son by her side in Lake Bluff, IL. She lived a very full 97 years. Lu was born to Bessie Mae and Thomas Clayton, Sr. on March 30, 1921 in Salisbury, MD. She moved with her family to Glenmoore, PA as a child where she was raised on a dairy farm and milked more than her fair share of cows – 2 times a day, seven days a week. She carried that work ethic and “can do” spirit throughout her life. She attended Font School in Font, PA, a 1 room schoolhouse where Mrs. Ash taught grades K – 8. She and her siblings actually did walk through snow drifts up and down hills more than 3 miles to elementary school on winter days! Instead of attending high school in her home Downingtown district, Lu and her siblings made the 35-mile round trip to the more highly regarded West Chester High. Fresh out of high school in 1939 she went to work for National Foam, Inc., the world leader in foams used to fight fires both domestically and throughout the world during the World War II era. She appeared in the June 1945 edition of Popular Science, eating National’s all natural, plant-based foam to illustrate its’ revolutionary, environmentally safe characteristics. After meeting Bob Zobel on a blind date and falling in love, she married the lucky guy on May 13, 1950. During their time in West Chester, they built two homes in North Hill where they raised their family – Greg, Dawn and Kimberly. Indefatigable, Lu was the prototype mid-century mother and homemaker. 1975 saw the family move to Lake Forest, IL following Bob’s promotion to a senior position at Rust Oleum Corporation. Always warm and convivial, Lu made fast friends in many family and social circles in Lake Forest including the Newcomers Club, Towne Club, Tuesday Swingers, Lunch Bunch, and several Bridge groups. As soon as her youngest was off to college, she enthusiastically went to “work” at a time when most of her peers were retiring. Her “work” amounted to more than 30 years and 25,000 hours of daily volunteer service at Northwestern Medicine Lake Forest Hospital, starting at 6am daily. Lu was known for her unique ability to set your mind at ease no matter what medical or personal obstacle you faced. She was recognized with several volunteer honors including the 2010 “I Care” award, the 1991 Lake County Medical Society’s Citizens Award, and the Outstanding Volunteer Award from both the Northshore Senior Center and NM Lake Forest Hospital. 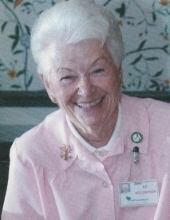 As a longstanding member of the NM Lake Forest Hospital Women’s Board, she was very active in many philanthropic projects that had a significant impact in the lives of the hospital’s patients, employees, and staff. To know Lu Zobel is to know one of God’s most loving, caring, embracing, and authentic human beings. Her “light” was definitely always on. She was preceded in death by her husband, Bob Zobel; sister, Louise McCardell; and brother Lewis Clayton, Jr.
She is survived by her children, Greg Zobel (Faith), Dawn Papineau and Kim Sturonas (Joe); and her grandchildren Katie Novak, Nicole Williams, Mike Margileth, Alex Zobel, Chad Papineau, Gregory Zobel, Kalla Sturonas and Megan Sturonas; and her great-grandchild Millie Lu Anderson. Lake Forest, IL – Visitation will be held from 5 p.m. to 8 p.m., Wednesday February 6, 2019 at Weban Funeral Home in Lake Forest. Glenmoore, PA – Visitation will be held from 1 p.m. to 1:30 p.m., Sunday, February 10 at Fairview Evangelical Presbyterian Church in Glenmoore, PA. Funeral and graveside services will follow at 1:30 p.m. In lieu of flowers, contributions are requested to be made in Lu’s name to Northwestern Medicine Lake Forest Hospital for “Patient and Family Assistance”. To plant a tree in memory of LuVerne Clayton Zobel, please visit our Tribute Store. Northwestern Medicine Lake Forest Hospital for “Patient and Family Assistance"
"Email Address" would like to share the life celebration of LuVerne Clayton Zobel. Click on the "link" to go to share a favorite memory or leave a condolence message for the family.